WRKY transcription factors (TFs) participate in various physiological processes of plants. Although WRKY genes have been well studied in model plants, knowledge of the functional roles of these genes is still extremely limited in cotton. In this study, a group IId WRKY gene from cotton, GhWRKY42, was isolated and characterized. Our data showed that GhWRKY42 localized to the nucleus. A transactivation assay in yeast demonstrated that GhWRKY42 was not a transcriptional activator. A β-glucuronidase (GUS) activity assay revealed that the promoter of GhWRKY42 showed fragment deletion activity in Nicotiana tabacum and was mainly expressed in the roots, stems and leaves of ProGhWRKY42::GUS transgenic Arabidopsis plants. Quantitative real-time PCR (qRT-PCR) analysis indicated that GhWRKY42 was up-regulated during leaf senescence and was induced after exposure to abiotic stresses. Constitutive expression of GhWRKY42 in Arabidopsis led to a premature aging phenotype, which was correlated with an increased number of senescent leaves, reduced chlorophyll content and elevated expression of senescence-associated genes (SAGs). In addition, virus-induced gene silencing (VIGS) was used to silence the endogenous GhWRKY42 gene in cotton, and this silencing reduced plant height. Our findings indicate that GhWRKY42 is involved in abiotic stress responses, premature leaf senescence and stem development. This work establishes a solid foundation for further functional analysis of the GhWRKY42 gene in cotton. Plants are constantly challenged by various factors that affect plant growth and development throughout their life cycle. To combat these challenges, some responsive genes, including WRKY transcription factors (TFs), are induced to help plants adapt through physiological and morphological changes . WRKY TFs are plant-specific proteins and constitute one of the largest TF families in plants . WRKY TFs share the common feature of a highly conserved WRKY domain that consists of the peptide sequence motif WRKYGQK at the N-terminus and a zinc-finger-like motif at the C-terminus . WRKY TFs have one or two conserved WRKY domains, and these domains contain a Cx4-5Cx22-23HxH or Cx7Cx23HxC zinc-finger-like motif. Based on the number of conserved WRKY domains and the structural characteristics of the zinc-finger-like motifs, WRKY TFs can be categorized into group I, group II or group III. Group II can be further divided into subgroups IIa, IIb, IIc, IId and IIe [3–7]. WRKY TFs can recognize and bind to the W-box sequences [TTGAC(C/T)] in the promoter region of target genes to participate in regulatory networks . In plants, WRKY TFs are mainly involved in defense responses, trichome development, plant growth and development and leaf senescence . Various TFs are involved in modulating leaf senescence, and 1533 TFs have been identified via leaf senescence transcriptome analyses in Arabidopsis [10, 11]. WRKY TFs are quantitatively important members of those TFs involved in leaf senescence . In Arabidopsis, AtWRKY6 is associated with the senescence process by targeting the promoter of the SIRK gene, which likely encodes a signaling component related to leaf senescence . AtWRKY45 was recently reported to interact with the DELLA protein RGA-LIKE1 (RGL1) and to directly target the SAG12, SAG13, SAG113 and SEN4 genes, to positively modulate leaf senescence via the gibberellic acid-mediated signaling network . In rice, OsWRKY42 promotes senescence in transgenic rice plants by binding to the promoter of OsMT1d to repress ROS scavenging . OsWRKY23 is markedly increased during dark-induced leaf senescence, and OsWRKY23-overexpressing lines can accelerate leaf senescence under dark conditions . Furthermore, TaWRKY7 from wheat can significantly promote senescence in transgenic Arabidopsis under dark conditions . According to previous reports, WRKY TFs are thought to be involved in the regulation of plant tissue growth and development. For example, VvWRKY2 is specifically expressed in the lignified cells of young grapevine stems, and overexpression of VvWRKY2 in N. tabacum affects the lignin biosynthesis pathway, thus influencing xylem development . Li et al. reported that Atwrky13 mutants exhibit weaker stems due to altered development of parenchyma cells . Another WRKY TF, WRKY71/EXB1, positively regulates plant branching by controlling axillary meristem initiation and bud activities . In addition, the pollen-specific WRKY TF AtWRKY34 is phosphorylated by two mitogen-activated protein kinases, MPK3 and MPK6, in the regulation of male gametogenesis . Furthermore, emerging evidence has demonstrated that WRKY TFs are widely involved in stress responses. For example, GhWRKY40 is involved in pathogen responses , and GhWRKY68 is involved in salt and drought stress responses . These reports further emphasize the importance of studying WRKY TFs. Cotton (Gossypium hirsutum) is an important economic crop that is widely cultivated around the world. As a significant source of fiber, oil and biofuel products, cotton has become an important industrial raw material. In field production, the growth and yield of cotton are severely restricted by both external environmental factors and internal factors. A growing number of studies have shown that WRKY TFs play important roles in the responses to these factors. Therefore, it is particularly important to study the functional roles of WRKY genes in cotton. In the present study, a group IId WRKY gene, GhWRKY42, was isolated and characterized. We performed a preliminary analysis of the gene structure, evolutionary relationships and expression patterns of GhWRKY42. Overexpression of GhWRKY42 in Arabidopsis accelerated leaf senescence. In addition, silencing GhWRKY42 in VIGS plants significantly reduced plant height. We previously identified several WRKY genes in cotton that were up regulated by abiotic stresses, during leaf senescence and in vegetative organs using cDNA microarray and RNA-Seq data . Among them, we selected GhWRKY42 for further study. The sequence analysis results showed that GhWRKY42 contained a 1038-bp ORF, encoding 345 amino acids. The predicted protein isoelectric point was 9.38, and the molecular weight was 37.88 kDa. The results of comparative analysis of the GhWRKY42 coding and genomic sequences indicated that GhWRKY42 harbored three exons and two introns (Fig. 1a). The multiple sequence alignment results revealed that the GhWRKY42 protein contained one WRKY domain, consisting of a conserved WRKYGQK core sequence and a C2H2 (C-X5-C-X23-H-X1-H) zinc-finger-like motif. Therefore, GhWRKY42 belongs to the group II WRKY subfamily according to Eulgem et al. . Furthermore, a putative nuclear localization signal (NLS) sequence (KKRK) and a conserved HARF structural motif were found within the GhWRKY42 amino acid sequence, which are shared among group IId WRKY proteins (Fig. 1b). A phylogenetic tree was built to evaluate the evolutionary relationship between GhWRKY42 and other group II WRKY members from different species (Fig. 2). As shown in Fig. 2, GhWRKY42 was closely associated with group IId members, which was consistent with the results of the amino acid alignment analysis. Consistent with the identified NLS sequence, the subcellular location prediction software Plant-mPloc (http://www.csbio.sjtu.edu.cn/bioinf/plant-multi/) predicted that the GhWRKY42 protein localizes to the nucleus. To confirm our prediction, the 35S-GhWRKY42::GFP vector was constructed and transferred into onion epidermal cells. The 35S::GFP construct served as a control. The onion epidermal cells harboring the 35S-GhWRKY42::GFP construct emitted green fluorescence predominantly in nuclei (Fig. 3a), whereas 35S::GFP fluorescence occurred widely throughout the cell . The transcriptional activation of GhWRKY42 was examined with a GAL4 yeast system. The plasmids pGADT7-largeT+pGBKT7-GhWRKY42 (experimental group), pGADT7-largeT+pGBKT7-p53 (positive control) and pGADT7-largeT+pGBKT7-laminC (negative control) were transformed into Y2HGold yeast cells. All transformants grew well on SD/−Trp/−Leu medium. The transformants of the positive control grew well on SD/−Trp/−Leu/-His/−Ade medium, but similar to the negative control, the experimental group did not grow on this medium (Fig. 3b). A 1943-bp GhWRKY42 promoter fragment was obtained, and putative cis-elements were analyzed using the PlantCARE database. A group of putative cis-elements were identified in the promoter region, which were mainly involved in defense, stress, light and metabolic responses (Additional file 1: Table S1). The results of GUS staining for the promoter deletion constructs showed that pBI121 (positive control) as well as ProGhWRKY42::GUS (− 1943 bp to − 1 bp), ProGhWRKY42–1::GUS (− 1407 bp to − 1 bp) and ProGhWRKY42–2::GUS (− 778 bp to − 1 bp) produced blue dots, whereas ProGhWRKY42–3::GUS (− 391 bp to − 1 bp) did not (Fig. 4a). The GUS staining results for different tissues showed that GUS was mainly active in the roots, stems and leaves of ProGhWRKY42::GUS transgenic Arabidopsis plants and was also detectable in the stamens but not in the pistils, petals or pods (Fig. 4b). To evaluate the expression patterns of GhWRKY42 following various stresses, ten-day-old cotton seedlings were exposed to MeJA, ABA, drought and salt treatments. As shown in Fig. 5, GhWRKY42 was found to be differentially up-regulated under MeJA, ABA, drought and salt treatments. GhWRKY42 expression was rapidly induced at 2 h after MeJA treatment, reaching its maximum accumulation at 4 h (4.6-fold induction) and then gradually decreasing (Fig. 5a). Similarly, GhWRKY42 expression was induced at 2 h after ABA treatment but exhibited maximum transcript levels at 6 h with 2.7-fold induction (Fig. 5b). Under drought treatment, the GhWRKY42 transcript was differently elevated at different time points and peaked at 12 h (6.5-fold induction) (Fig. 5c). However, under salt treatment, the expression of GhWRKY42 was dramatically increased at 2 h, and a high expression level was maintained in the subsequent 4–12 h (Fig. 5d). qRT-PCR was performed to detect the transcript levels of GhWRKY42 in the roots, stems, leaves, petals, pistils, stamens, fiber and ovules. GhWRKY42 was found to be differentially expressed in different tissues. GhWRKY42 was strongly expressed in vegetative organs, including the stems, roots and leaves but was weakly expressed in the petals, pistils, stamens, fiber and ovules (Fig. 6a). To evaluate the expression pattern of GhWRKY42 during leaf senescence, qRT-PCR was performed using cotton leaves at different senescence stages. The transcriptome data analysis [23, 25] showed that the expression level of GhWRKY42 gradually increased with the senescence of leaves (Fig. 6b). We further examined the expression level of GhWRKY42 in true leaves of CCRI74 plants at different senescence stages ; the results revealed that the transcript levels of GhWRKY42 gradually increased as the leaves aged (Fig. 6c). In addition, the expression level of GhWRKY42 was detected in cotyledon samples from the early-aging cotton variety CCRI10 and the non-early-aging variety Liao4086. The qRT-PCR results showed that the transcript levels of GhWRKY42 increased gradually during cotyledon senescence and were significantly higher in CCRI10 than in Liao4086 (Fig. 6d). The transcript of GhWRKY42 was highly accumulated in the senescent leaves of cotton. To further clarify the functional role of GhWRKY42 in response to leaf senescence, GhWRKY42 was transformed into Arabidopsis plants. The transgenic lines were confirmed by qRT-PCR (Fig. 7a). As shown in Table 1, the GhWRKY42 transgenic plants flowered earlier and had fewer rosette leaves than the WT plants. In addition, the senescence phenotypes of the transgenic and WT plants were observed at different developmental stages, and the ratio of senescent leaves was counted. Compared with the WT, the transgenic lines exhibited severe aging phenotypes at four, five and seven weeks (Fig. 7b), which were reflected by a significantly higher ratio of senescent cotyledons at four weeks (Fig. 7c), a higher ratio of senescent true leaves (rosette leaves) at five weeks (Fig. 7d) and a lower chlorophyll content at seven weeks (Fig. 7e). To elucidate the possible mechanisms of GhWRKY42-mediated precocious senescence, we examined the effects of GhWRKY42 on the transcript levels of senescence-associated marker genes during natural leaf senescence. The genes included AtNAP (NAC domain TF) (At1g69490), AtSAG12 (At5g45890), AtSAG13 (At2g29350), AtWRKY6 (WRKY DNA-binding protein 6) (At1g62300) and AtORE1/AtNAC6 (NAC domain TF) (At5g39610), which are all factors that are up-regulated during aging in Arabidopsis [26–30]. As shown in Fig. 8a-e, the expression of all senescence-associated marker genes in the transgenic plants was significantly up-regulated compared with that in the WT plants. In addition, we identified the expression levels of two ABA-responsive genes, AtABF2 (ABA-responsive element binding factor 2) (AT1G45249)  and AtHAB1 (hypersensitive to ABA1) (AT1G71770) , in Arabidopsis. The expression levels of both genes were significantly elevated in the transgenic plants compared with the WT plants (Fig. 8f, g). To further identify the functional role of GhWRKY42, VIGS of GhWRKY42 was performed using the cotton variety CCRI10. Two weeks later, the cotton plants harboring pCLCrVA-PDS showed an albino phenotype, suggesting that the VIGS assay was successful (Fig. 9a). qRT-PCR was performed to evaluate the effect of gene silencing. 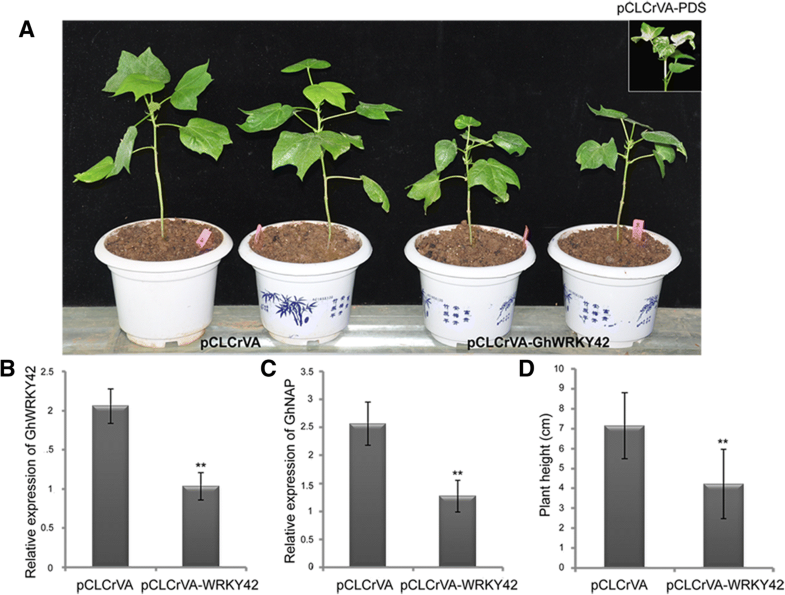 Expression level of GhWRKY42 was significantly lower in the silenced plants (pCLCrVA-GhWRKY42) than in the control plants (pCLCrVA) (Fig. 9b). The expression of the senescence-associated marker gene GhNAP was also markedly reduced in the silenced plants (Fig. 9c). As shown in Fig. 9a, the silenced plants exhibited a relatively lower plant height phenotype than the control plants, and the lower plant height phenotype was statistically analyzed (Fig. 9d). The WRKY TF family is one of the largest superfamilies of regulatory proteins in plants . In the past several years, growing evidence has shown that members of the WRKY gene family mainly participate in stress responses, plant growth and development and leaf senescence . However, studies on WRKY TFs have mainly focused on model plant species, while only a few of these genes have been evaluated in cotton. In this study, we isolated a group IId GhWRKY42 gene from upland cotton and characterized its functional roles. 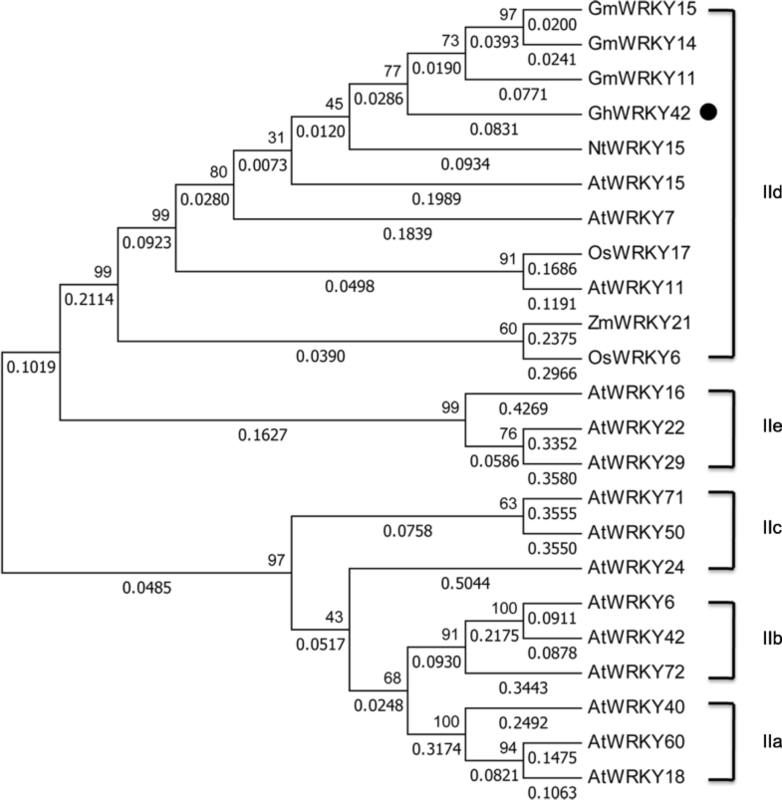 The results of multiple sequence alignment and phylogenetic tree analyses revealed that the GhWRKY42 gene is a member of the group IId WRKY family. Subcellular localization analysis revealed that the GhWRKY42 protein is located in the nucleus. These findings are consistent with the predicted nuclear-targeting signal sequence and with the results of studies on another group IId TF, GhWRKY11, in cotton . The results of transcriptional activation analysis in yeast have shown that the GhWRKY42 protein has no transcriptional activation activity; these findings are similar to those reported for PtrWRKY40 from Populus trichocarpa . 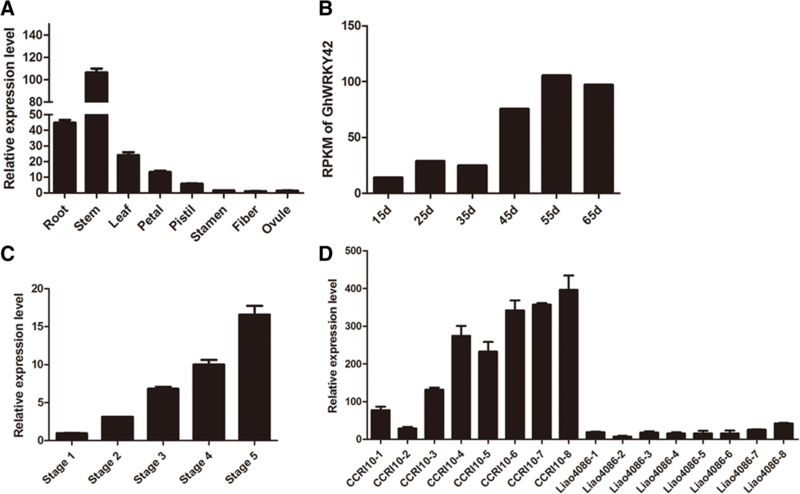 These results suggest that GhWRKY42 may be a nuclear protein that functions in the cell nucleus but may be not a transcriptional activator. The expression patterns of genes are often used as an indicator of their functional roles . For example, GhWRKY17 has been shown to be induced by salt and drought treatments, and overexpression of GhWRKY17 in N. tabacum results in a more sensitive phenotype to drought and salt stresses . Previous studies have shown that a large number of genes can be induced by various abiotic stresses . In our study, GhWRKY42 was demonstrated to be differentially induced under MeJA, ABA, drought and salt treatments in cotton. In addition, many stress response cis-elements were found in the promoter region of GhWRKY42. These findings suggested that GhWRKY42 might be involved in the regulation of abiotic stress networks. The 5′ promoter deletion assay is often used to investigate promoter expression characteristics and the functional roles of regulatory elements in promoter regions. The structure and function of promoter deletion fragments can be suggested by evaluating promoter deletion construct-driven reporter genes in transgenic plants . In our study, a promoter deletion assay showed that ProGhWRKY42–3::GUS (− 391 bp to − 1 bp) was unable to activate expression of the GUS gene and that ProGhWRKY42–2:GUS (− 778 bp to − 1 bp) contained the shortest sequence exhibiting promoter activity. Therefore, it is speculated that critical cis-elements may exist within the − 778 bp to − 391 bp upstream region of the GhWRKY42 promoter. The cis-elements in this region were predicted, it was found to contain not only TATA-box and light response elements but also stress response elements such as ABRE (ABA response element), the CGTCA motif (MeJA response element), HSE (heat response element) and the TGACG motif (MeJA response element). These elements may play an important role in ensuring that the promoter drives the expression of downstream genes. WRKYs can directly bind to the W-box [TTGAC(C/T)] in the promoter of target genes to modulate stress responses, plant development and leaf senescence [40, 41]. Liu et al. reported that W-box and G-box cis-elements are important positive regulators during leaf senescence in rice. Both elements are significantly plentiful in the promoter regions of up-regulated TFs (including WRKYs) that regulate leaf senescence . W-box and G-box cis-elements were identified in the promoter region of GhWRKY42, suggesting that GhWRKY42 may be involved in leaf senescence and be regulated by other GhWRKYs or by the gene itself during this process. These findings laid the foundation for further analysis of the upstream regulatory mechanism of GhWRKY42. Senescence is a natural phenomenon and prevails among all living organisms, including plants. During leaf senescence, genetic and environmental factors affect mature leaves, leading to the initiation of leaf senescence; this senescence is accompanied by chlorophyll, membrane, protein and nucleic acid degradation as well as nutrient relocation from senescing leaves to growing organs or storage tissues [42–45]. Crop productivity is mainly determined by the yield per area, but leaf senescence severely affects crop yield . Thus, studying the mechanism of leaf senescence is particularly important. In the present study, the expression level of GhWRKY42 was found to be up-regulated during natural senescence and exhibited significantly higher expression in the early-aging cotton variety CCRI10 than in the non-early-aging variety Liao4086. It has been reported that the GhNAC12 gene, which is more highly expressed in CCRI10 than in Liao4086 during leaf senescence, causes an early-aging phenotype in Arabidopsis . Therefore, GhWRKY42 may be involved in the aging process and may play a positive regulatory role during leaf senescence. Consistent with our prediction, overexpression of GhWRKY42 did lead to an advance of leaf senescence in transgenic Arabidopsis. In a previous study, overexpression of AtWRKY45 in Arabidopsis was observed to up-regulate expression of representative SAGs during age-triggered leaf senescence . 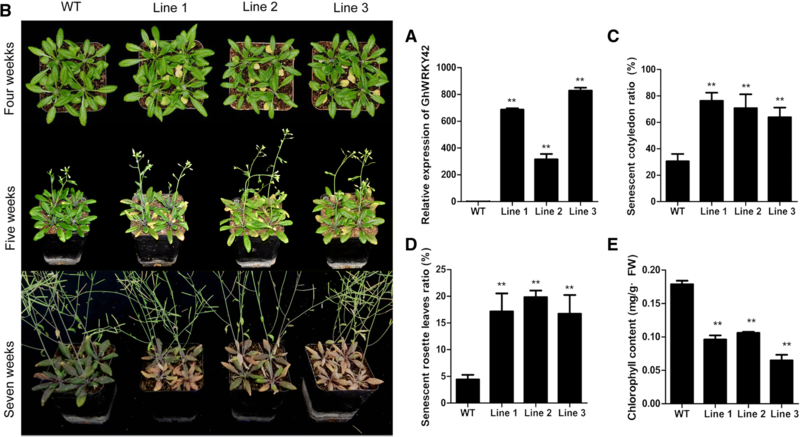 Phenotypic observations of overexpressing Arabidopsis lines and RNAi cotton lines show that GhNAP positively regulates leaf senescence through ABA-mediated pathways . Phytohormones, such as ABA, ethylene, MeJA, and salicylic acid, have been demonstrated to promote leaf senescence . 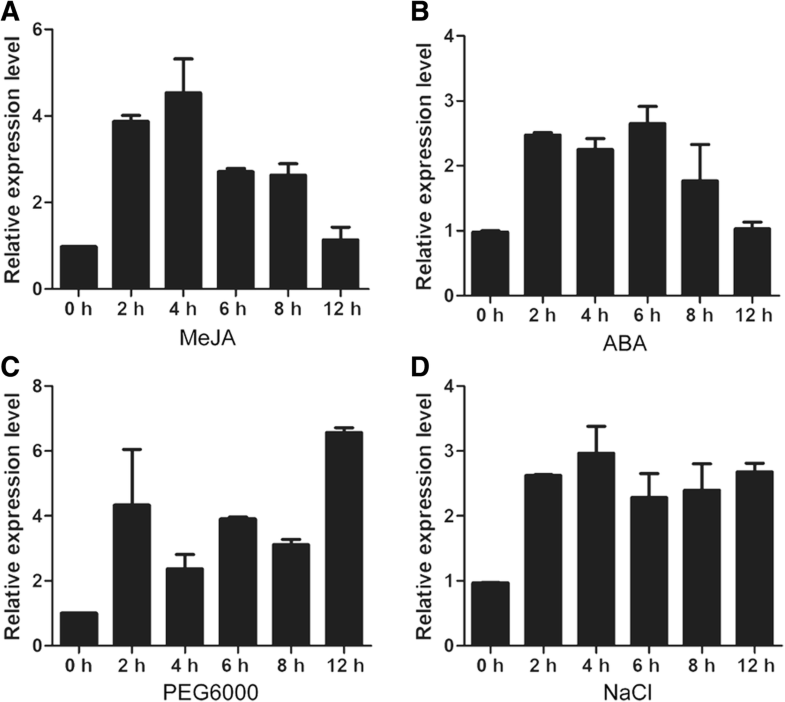 The ABA content increases in aged leaves, and endogenously applied ABA promotes expression of some SAGs . ABA-responsive genes, which are involved in the ABA signaling pathway, are induced in senescing Arabidopsis . In our study, SAGs and ABA-responsive genes were significantly accumulated in the GhWRKY42 transgenic lines, suggesting that GhWRKY42 may be associated with leaf senescence via ABA-mediated pathways. Previous studies have shown that some genes are closely associated with plant height. Wei et al. identified the QTL DTH8 in rice, which includes the HAP3 gene and regulates yield, plant height and flowering time . WRKY TFs such as LP1 in foxtail millet and OsWRKY78 in rice have all been shown to play an important role in stem elongation and plant height [51, 52]. In our study, we detected high expression levels and strong GUS activity of GhWRKY42 in the stem and reduced height in VIGS plants. Therefore, we hypothesized that GhWRKY42 might be related to stem development. Plant height is an important plant architecture trait, and decreased height is beneficial for mechanical harvesting and lodging resistance . Our findings provide a basis for breeding new cotton varieties with an ideal plant type. However, further studies are needed to elucidate the pathways involved in the GhWRKY42-mediated mechanism. GhWRKY42, a group IId WRKY member, is closely associated with leaf senescence and plant development. GhWRKY42 is located in the nucleus and exhibits no transcriptional activity. GhWRKY42 is induced by leaf senescence and various stresses. Ectopic expression of GhWRKY42 in Arabidopsis promotes leaf senescence, and VIGS cotton plants exhibit a decreased plant height phenotype. Our work could lead to a better understanding of the functional roles of WRKY genes in cotton. However, how the GhWRKY42 gene regulates leaf senescence and plant height development requires further study and clarification. Two early-aging cotton varieties, CCRI10 and CCRI74, and a non-early-aging variety, Liao4086, were used in our experiments. The cotton varieties were cultivated in the field of the Cotton Research Institute of the Chinese Academy of Agricultural Sciences (Anyang, Henan, China). Different tissues were collected from CCRI10 plants. Roots and stems were collected from two-week-old seedlings. Leaves were collected from newly flattened leaves. Petals, pistils and stamens were sampled at anthesis, and fiber and ovules were harvested at 10 days post anthesis. To evaluate the expression pattern of GhWRKY42 during leaf senescence, cotyledons were collected from two cotton varieties, CCRI10 and Liao4086, which exhibit different aging characteristics. We collected cotyledon samples weekly at eight different developmental stages, ranging from the flattened cotyledon stage to the completely aged stage. The expression patterns of GhWRKY42 were further evaluated in true leaves of the early-aging cotton variety CCRI74 at five aging stages, as described previously . Each sample included material from eight different individual plants, and we performed three repetitions for each sample. To evaluate the stress response of GhWRKY42 in cotton, 10-day-old CCRI10 cotton seedlings were planted in pots for subsequent stress treatments. The CCRI10 cotton seedlings were planted in a growth chamber at 25 °C, with a 16 h light/8 h dark cycle. For the abiotic stress treatment, the seedlings were irrigated with 15% polyethylene glycol 6000 (PEG6000) and 200 mM sodium chloride (NaCl); for the signaling molecule treatment, the seedlings were sprayed with 100 μM methyl jasmonate (MeJA) and 200 μM abscisic acid (ABA). Each cotyledon sample included material collected from eight uniform plants, and each treatment was repeated three times. The samples were harvested at 0 h, 2 h, 4 h, 6 h, 8 h and 12 h. All samples were quickly frozen in liquid nitrogen for subsequent RNA extraction. To amplify the full-length cDNA and genomic sequences of GhWRKY42, primers were designed based on the coding sequence of GhWRKY42 (accession KF669797) submitted to NCBI by Dou et al. . The primers used for this purpose are listed in Additional file 2: Table S2. The full-length cDNA and genomic fragments of GhWRKY42 were amplified from cDNA and DNA, respectively, obtained from CCRI10 leaves at the five-leaf stage. The fragments were subsequently inserted into the pMD18-T vector (TaKaRa, China) and transformed into Escherichia coli competent cells (E. coli DH5a) for sequencing. The genomic and coding sequences of GhWRKY42 were submitted to Gene Structure Display Server online software (GSDS2.0) (http://gsds.cbi.pku.edu.cn/) to predict gene structures. Multiple sequence alignment was conducted using DNAMAN software, and a phylogenetic tree was built by using MEGA 7 software. The GhWRKY42 promoter fragment was amplified from DNA, and the online software PlantCARE (http://bioinformatics.psb.ugent.be/webtools/plantcare/html/) was employed to predict cis-acting elements. Total RNA was isolated using RNAprep PurePlant Kit (Polysaccharides & Polyphenolics-rich) (Tiangen, China). One microgram of total RNA was prepared for cDNA synthesis in a 20 μl reaction system using a PrimeScript™ RT reagent kit with gDNA Eraser. The cDNA was diluted 5 times for qRT-PCR. Transcript levels were detected using a 7500 Real-Time PCR system (Applied Biosystems) and SYBR® Premix Ex Taq™ II (Tli RNaseH Plus) (TaKaRa). The 20 μl reaction volume contained the following components: 10 μl of SYBR Premix Ex Taq II (Tli RNaseH Plus) (2×), 0.8 μl of the PCR forward primer (10 μM), 0.8 μl of the PCR reverse primer (10 μM), 0.4 μl of ROX Reference Dye II (50×), 2 μl of cDNA and 6 μl of ddH2O. The optimal PCR amplification procedure used was as follows: a pre-denaturation step at 95 °C for 30 s; 40 cycles of 95 °C for 5 s and 60 °C for 34 s; and a melting curve step at 95 °C for 15 s, 60 °C for 1 min and 95 °C for 15 s. GhActin and AtActin2 were used as reference genes. The 2−ΔΔCT method was applied to calculate relative expression levels . Three independent experiments were performed, and all reactions were performed with three technical replicates. The open reading frame (ORF) of GhWRKY42 without the termination codon was cloned into the pBI121-GFP vector to generate the 35S-GhWRKY42::GFP construct, driven by the cauliflower mosaic virus 35S promoter. The 35S-GhWRKY42::GFP plasmid was extracted to obtain a plasmid concentration of at least 1 μg/μl. The inner epidermis of a fresh onion was cut into approximately 1.5 × 1.5 cm pieces with a scalpel on a clean bench. The epidermal pieces were then transferred to solid Murashige and Skoog (MS) medium and cultivated at 28 °C for 3–6 h in darkness. The gene gun device was sterilized and was placed on a clean bench, and the bombarding chamber and some accessories were cleaned with 75% alcohol. After the particulate carrier membrane was washed with 70 and 100% alcohol, plasmids encased in gold powder were added to the middle of the particulate carrier membrane. After the membrane dried slightly, the onion epidermis was bombarded using the gene gun with the following parameters: particle bombardment running distance, 9 cm; rupture disk pressure, 1300 psi; and vacuum degree, 28 mmHg. The epidermis after bombardment was transferred to fresh MS agar medium at 25 °C for 12 h in darkness. The resulting green fluorescence was detected using a confocal laser scanning microscope (Zeiss LSM 700) at a wavelength of 488 nm. The ORF of GhWRKY42 was cloned into the pGBKT7 vector to construct pGBKT7-GhWRKY42. The pGADT7-largeT+pGBKT7-GhWRKY42 (experimental group), pGADT7-largeT+pGBKT7-p53 (positive control) and pGADT7-largeT+pGBKT7-laminC (negative control) plasmids were transformed into Y2HGold yeast competent yeast cells. The transformed yeast products were spread on corresponding dropout selective medium plates that did not contain tryptophan or leucine (SD/−Trp/−Leu) and incubated for 3–5 days at 30 °C. 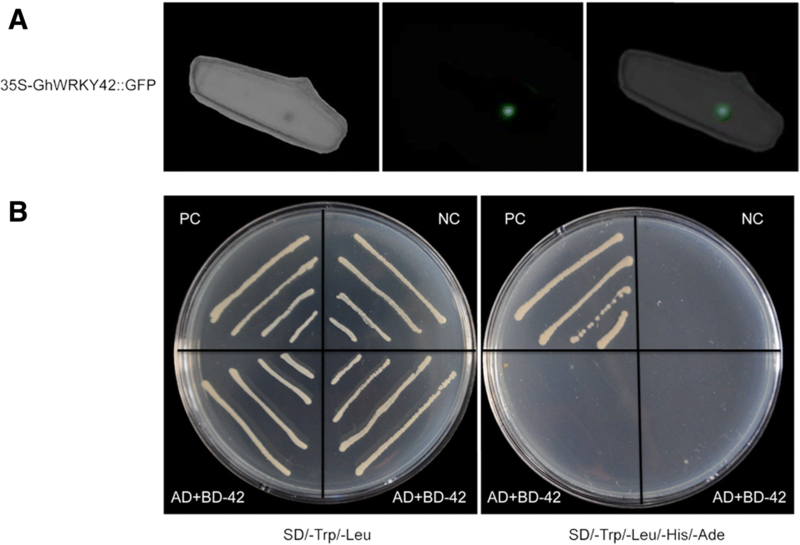 Positive clones were identified and streaked on SD/−Trp/−Leu medium plates and plates containing medium without tryptophan, leucine, histidine or adenine (SD/−Trp/−Leu/-His/−Ade). The plates were inverted and incubated at 30 °C for 3–5 days to identify transcriptional activity. The ORF of GhWRKY42 was inserted into the binary expression vector pBI121 driven by the 35S promoter to generate the 35S::GhWRKY42 construct. The GhWRKY42 promoter fragment was also inserted into the pBI121 vector by replacing the 35S promoter to generate the ProGhWRKY42::GUS construct. The 35S::GhWRKY42 and ProGhWRKY42::GUS constructs were individually introduced into Agrobacterium tumefaciens strain LBA4404 and transformed into Arabidopsis ecotype Columbia using the floral-dip method . For the screening of positive plants, seeds of the T0 generation (harvested from the wild-type (WT)) were sterilized and selected on 1/2 MS solid medium plates (0.22% MS modified basal salt mixture, 3% sucrose and 0.8% agar powder) containing kanamycin (50 mg/L). The plates containing the seeds were chilled at 4 °C for 3 days in darkness, after which they were transferred to an incubator at 22 °C under a 16 h light/8 h dark cycle with a light intensity of 100 μmol m− 2 s− 1. Two weeks later, the green seedlings on the plates were selected and transplanted into the nutrient soil in a growth chamber. The positive plants were further verified using PCR, and selfed seeds harvested from the positive plants were employed as the T1 generation. Using the same method, the seeds were screened until the T3 homozygous generation. The phenotypic characteristics of the transgenic and WT plants were observed at different developmental stages. Based on the position of stress response cis-elements in the GhWRKY42 promoter, four promoter deletion fragments were delimited. The four fragments were amplified from the pMD18-T vector containing the GhWRKY42 promoter and inserted into the pBI121 vector by replacing the 35S promoter. As a result, four promoter deletion plasmids, ProGhWRKY42::GUS (− 1943 bp to − 1 bp), ProGhWRKY42–1::GUS (− 1407 bp to − 1 bp), ProGhWRKY42–2::GUS (− 778 bp to − 1 bp) and ProGhWRKY42–3::GUS (− 391 bp to − 1 bp), were constructed and transformed into LBA4404. Transient expression in N. tabacum was performed in accordance with previously described methods . Transgenic Arabidopsis plants harboring the ProGhWRKY42::GUS construct were used to analyze organizational expression characteristics. GUS staining was performed as follows: the prepared materials were soaked in the GUS dye solution, after which the materials were placed in darkness at 25–37 °C overnight; the materials were then decolorized approximately 2–3 times using 70% alcohol until the negative control materials turned white, and the blue dots in the white background observed under microscopy were identified as GUS expression sites. For the VIGS assay, approximately 300-bp fragments amplified from the pMD18-T vector containing the GhWRKY42 gene were integrated into the pCLCrVA vector to construct pCLCrVA-GhWRKY42, which was then transformed into LBA4404. The LBA4404 strains carrying pCLCrVA-GhWRKY42, pCLCrVA (negative control) or pCLCrVA-PDS (positive control) were mixed with the strain harboring pCLCrVB (helper vector) (1:1 ratio, OD600 = 1.5) and co-injected into two fully expanded cotyledons of CCRI10 plants. In the VIGS assay, at least 20 seedlings were used per group. For qRT-PCR detection, samples from at least 6 uniform injected plants were used. The cotton plants were then cultivated at 22 °C with a 16 h light/8 h dark cycle in a greenhouse. The experiment was repeated three times. The detailed VIGS procedure was performed as previously described [57, 58]. Determination of the chlorophyll content was performed as described by Shah et al. .
We thank all authors for their contributions to the article. We also appreciate the reviewers and editors for their patience regarding this work. This work was supported by the National Key Research and Development Program of China (grant number 2016YED0101006). The funders had no role in the design of the study and collection, analysis, and interpretation of data and in writing the manuscript. SY designed the research program. HW, HW and JS analyzed the data and revised the manuscript. LG performed the experiment and wrote the paper. All authors have read and approved the final manuscript. The experimental research on plants (either cultivated or wild), including collection of plant material, complied with institutional, national, or international guidelines. Field studies were conducted in accordance with local legislation. The plant materials used in this study were previously preserved in our laboratory.